At this time of year decisions are being made about whether to treat small grains seed with fungicide or insecticidal seed treatments before planting. If it promises to be a cool and damp start to the season, Pythium can be a problem in fields which are at, or above field capacity for moisture. Pythium can cause seedling death if infection occurs early in germination, leading to patchy stands. Infection of roots leads to browning of roots and root damage which can ultimately lead to poor seedling vigor. Temperatures for optimal development of Pythium range between 10 -20 °C (50-68°F). For Pythium control, seed treatments which contain mefanoxam (metalaxyl) can guard against early infection during germination. Roots however, may still become infected. 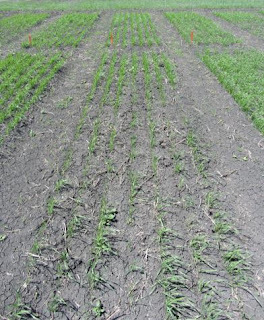 Ensuring adequate availability of nutrients such as phosphorous and nitrogen at seeding can help mitigate the potential for reduced uptake by infected roots. 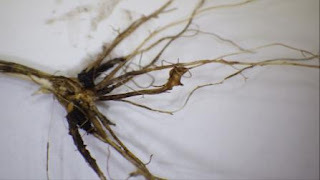 Aside from Pythium, two of the biggest issues as far as seedling diseases are concerned in Minnesota are Fusarium root and crown rot and Common root rot. Over the last few years in Minnesota, Fusarium root and crown rot has become the most widespread of these two diseases. Seed treatments which contain Tebuconazole should be effective against Fusarium root and crown rot. Other combinatory seed treatments which contain prothioconazole, tebuconazole and metalaxyl can help suppress common root rot as well as combating Fusarium root and crown rot. Sedaxane, belonging to the SDHI class of fungicides again has some efficacy against common root rot while also having being effective against Fusarium root and crown rot. For an overview, check out this handout on root disease, Fungicide seed treatments in small grains, For the latest information on seed treatments, check out this table from the 2018 NDSU Fungicide Guide. Some seed treatments also contain insecticides. These can be beneficial, especially if the crop is being planted on ground that has just come out of CRP. In general if we are looking to be cold and damp for the start of the season, Pythium control is a consideration. If the field has a history of root disease, treating the seed will help prevent stand establish problems. It is important to bear in mind that no seed treatment lasts season long, and so infections can occur later in the season causing some damage and the potential for tillers dying back, particularly under conditions of plant stress such as dry conditions. This is often noticed as white heads which are not due to wheat stem maggot or Fusarium head blight.